Too cool! Looks like the girls are mighty proud of you, too. Congrats! Congrats!! 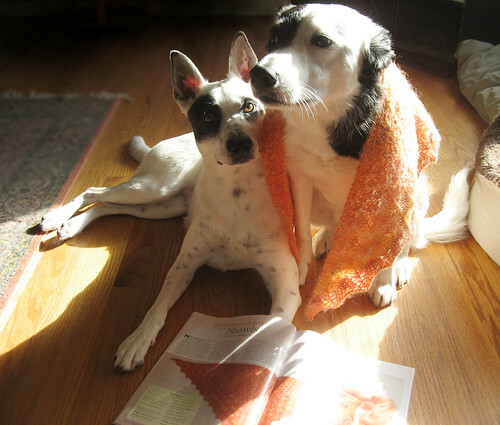 Was this shawl ever displayed at the Santa Monica Fiber Fest a few years ago? I remember ogling a pretty orange shawl when I was there. Haha, I love how the dogs are showing everything off so patiently. somtimes i think all those detail's don't matter so much ya know? knowing them doesn't make you an "expert". Having a beutiful FO you love and adore seems to be more then enough then having to be technical about it. I do love the details but sometimes it's more fun just to go for it and not worry about all that and if it's perfect. Sometimes it turns out perfect without even "trying". GRATZ! Fantastic!!! And much deserved - that shawl is exquisite and you are a fabulous knitter/spinner. Congratulations. I'm so pleased for you! PS - my copy of Spin Off is waiting for me in my PO Box. I can't wait to see the spread. Oh we just love the girls! They are so adorable! Hope one day we get to play together :) Mum said your shawl looks good. Congratulations! That's awesome. The models are adorable! You are very talented. Your creations always amaze me. Congrats!! I haven't even opened the new spin off yet. That is fantastic that you got a whole spread, I'll have to make sure I take time to look at it today. This is beautiful!! Very Beautiful! Oh wow, I'll have to go pick up that issue now!! Yay, Marnie!! Congratulations! It deserves a whole spread, indeed!! Yay Marnie! Beautiful shawl, and a well deserved recognition. Congratulations, Marnie! 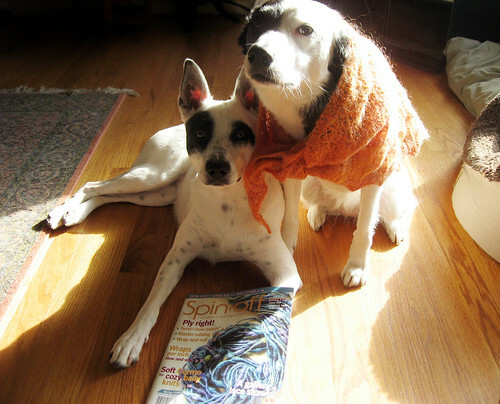 A beautiful shawl from great handspun certainly deserves a spread. Whee! Yay! I agree on the model... Panda is ALWAYS going to be cuter than any human model alive. This page contains a single entry by Marnie published on April 2, 2008 5:32 AM. Easter weekend was the previous entry in this blog. File this under, "brilliant people I know" is the next entry in this blog.